This entry was posted in Uncategorized and tagged emulation, image processing, image scaling, ppsspp, textures by petert. Bookmark the permalink. Any new improvements in xbrz? or they stopped working on it? I’ve introduced I new idea to improve the quality of xBR. Maybe it can interest you in implement for PPSSPP. I’ve been trying to find a way for years to upscale the original FF7 PS game without ruining the pre-rendered backgrounds. I have very little knowledge of how any of this works but was wondering if any of this would work, or if it’s a separate issue due to the backgrounds not being textures as such? It’s generally the same, the backgrounds are also textures. 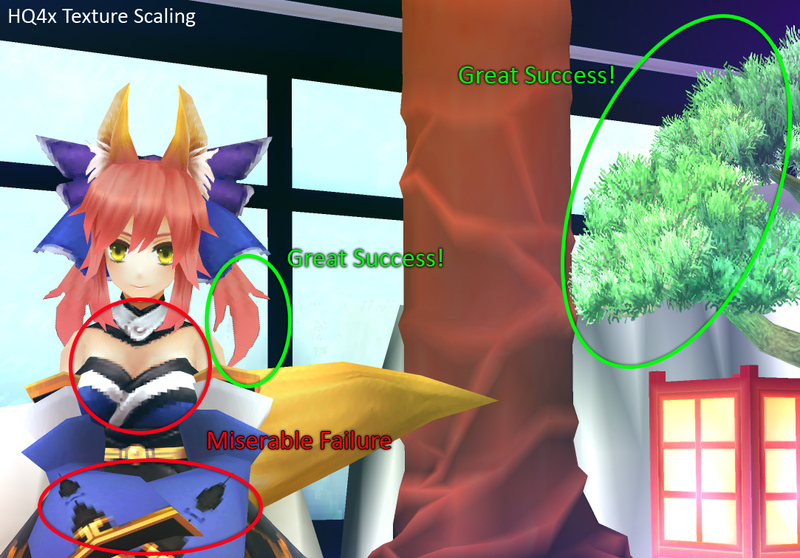 However, the upscaling options described here sadly wouldn’t really do all that much for those backgrounds. They primarily work well with clear geometric shapes that can be recognized, a pre-rendered background doesn’t really fall into that. Do you earn your bread with work like this? This was a really interesting post. I always wondered how emulators were able to improve so much on visual quality. Now I know a little more Thanks! That’s an excellent usage of xBR algorithm, I’m glad you like it. xBR isn’t finished yet. I have been keeping my research on it in my free time. It’s in constant evolution. Only to clarify a point in your text, I don’t agree xBRz is an improved xBR, but a question of taste. It’s a different flavor, I’d say. The core idea is the same, it’s just different in corner detection. It’s great the parallel implementation from Zenju could be useful in PPSSPP (an awesome emulator). Hi, thanks for your great work on xBR! I agree with you that xBRz is a different flavor more than a straight up improvement, I formulated that poorly. Since you are the one who originally came up with the algorithm, do you have any ideas on how to deal with the problems at texture edges? This is something that doesn’t really occur when scaling an entire screen or sprites. One idea would be to use black borders instead replicating texture edge pixels. It should take care of most artifacts.